From December 1939 she was trooping between Southampton, Cherbourg and Brest. Impressed for the Dunkirk evacuation, she made 2 trips to Folkestone on 29 and 31 May 1940 with a total of 2911 troops, but while returning on a third passage with over 3000 French troops she was damaged by bombs landing close to her stern. 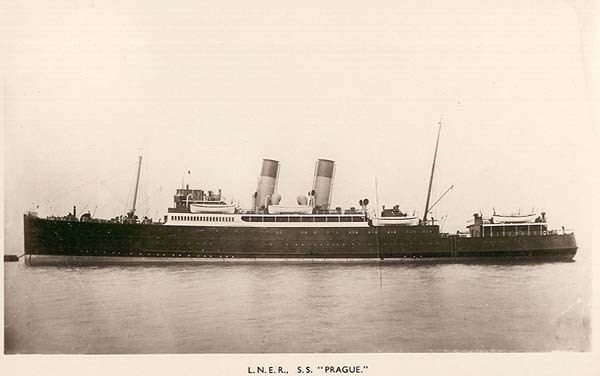 Her troops were transferred to other vessels and PRAGUE (under tow) was beached at Deal before being taken to the Thames for repairs, which were effected in 1941, following which she was engaged in trooping between Invergordon, Orkney and Shetlands through 1942 and into 1944. In March 1944 she was converted at North Shields into 'Hospital Carrier No.61', and saw service from the western beach-heads and from Cherbourg and Dieppe between June 1944 and June 1945, when she was released back to the G.E.R. After an 'austerity refit' she resumed service to Hoek van Holland on 14 November 1945. Released for reconditioning back at Clydebank, she suffered an explosion and fire there on 14 March 1948 and sank the next day, refloated on 6 May but judged to be beyond repair and arrived at Barrow-in-Furness for breaking on 14 September 1948.